In medium bowl, dissolve yeast in warm water. Stir in flour, sugar, salt and oil. Stir with fork until dough forms. Turn dough onto lightly floured surface; knead 12 times. Return to bowl. Cover; let rest 20 minutes. Heat oven to 425°F. Spray large cookie sheet with cooking spray; sprinkle with the cornmeal. Gently push fist into dough to deflate. Spray hands with cooking spray; press dough into 15x10-inch rectangle on cookie sheet. Bake 8 minutes. Spread pizza sauce over partially baked crust to within 1/2 inch of edge. 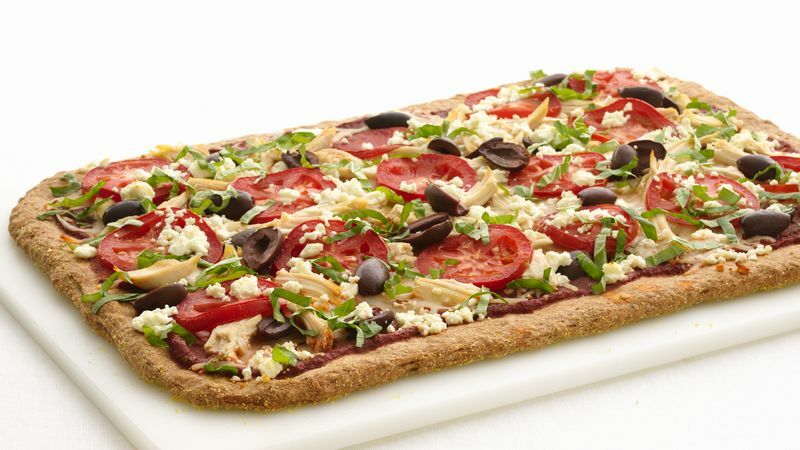 Top with mozzarella cheese, chicken, tomatoes, olives and feta cheese. Bake 10 to 15 minutes longer, or until cheese is melted and edges of crust are golden brown. Sprinkle with basil. Using an instant-read thermometer makes it easy to be sure that the water is the correct temperature to activate the yeast. Sliced ripe olives or any other variety can be used instead of the kalamata.